Choral conductors spend a large amount of time searching for the perfect piece to fit their choir. 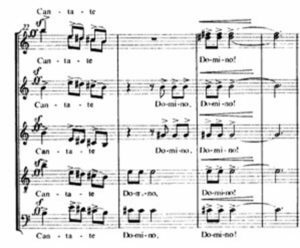 For many, the most challenging part of selecting repertoire is finding up-tempo choral literature. Slow works abound in our profession but fast-moving contrapuntal lines are hard to locate. Many composers seem to prefer delegating the burden of rhythmic drive and momentum to the piano or other accompanying instrument. Outstanding unaccompanied works with a fast tempo are particularly difficult to find. In the rehearsal room, we find that faster music is harder to master and it requires more repetitions to achieve excellence. Chorus members tend to learn faster music more slowly; they seem to understand harmonic language more quickly than counterpoint. For the conductor, the process of committing to a faster work is a bit of a risk and the payoff must be worth the effort required. We must make sure that the music we select is outstanding in quality and accessible to our choirs in the amount of time we have to learn it. 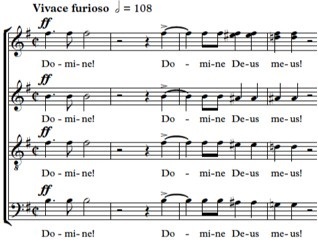 In an effort to assist the discovery of exceptional music of a faster tempo, this article presents five outstanding works drawn from the choral music of Hungary. The composers represent several generations and all are craftsmen of the highest quality. 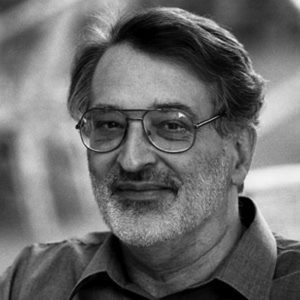 Jozsef Karai was born in 1927 and studied in Budapest and Pécs between 1935 and 1946. 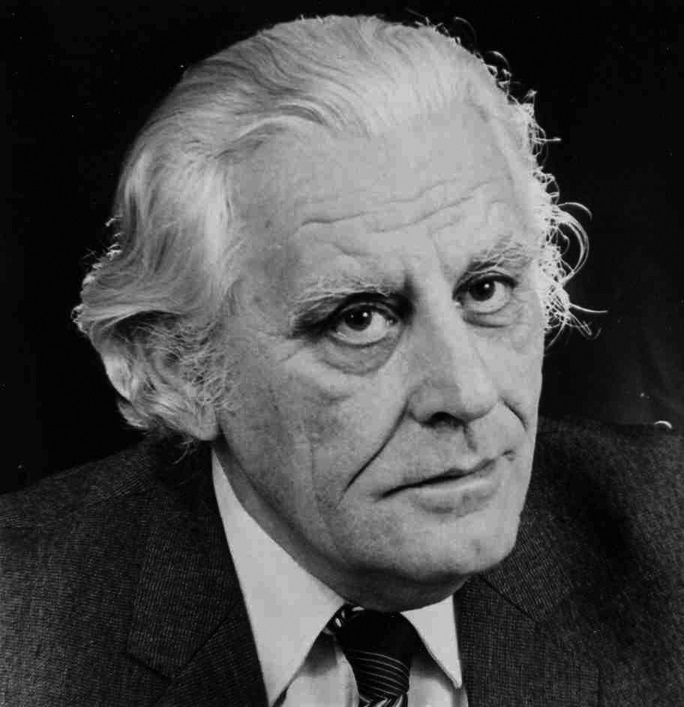 In the years between 1947 and 1954 he studied composition with János Viski and Ferenc Farkas and conducting with János Ferencsik, András Kórodi and László Somogyi at the Ferenc Liszt Academy of Music. 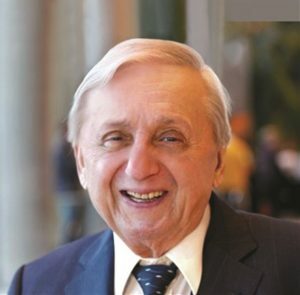 A popular choral conductor, he directed several choruses in Budapest and has composed a large body of choral music since 1969. 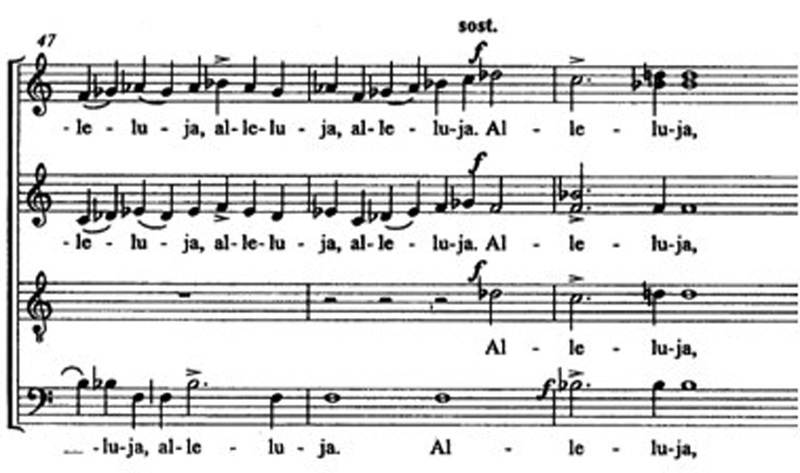 Karai’s Alleluja (EMC 198163) is one of the composer’s best known choral works. It looks to be a work that the composer struggled with for a time because it bears this note on the music: “On the 13th of May, 1981, after the unsuccessful attempt . . . . Revised in 1989.” The Karai Alleluia is an exciting piece of choral music and an excellent opening work or transition out of a slower piece of music. 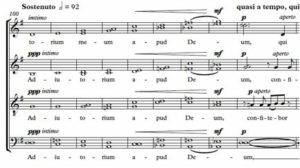 It begins with a chanted line (Figure 1) from a tenor soloist and then moves into a spirited entrance from each voice part. Although primarily in C Major, the piece temporarily passes through other key relationships that are easy to understand and sing. He arrives at each cadence logically and easily. The different cadences are similar to each other and they give unity to the work. 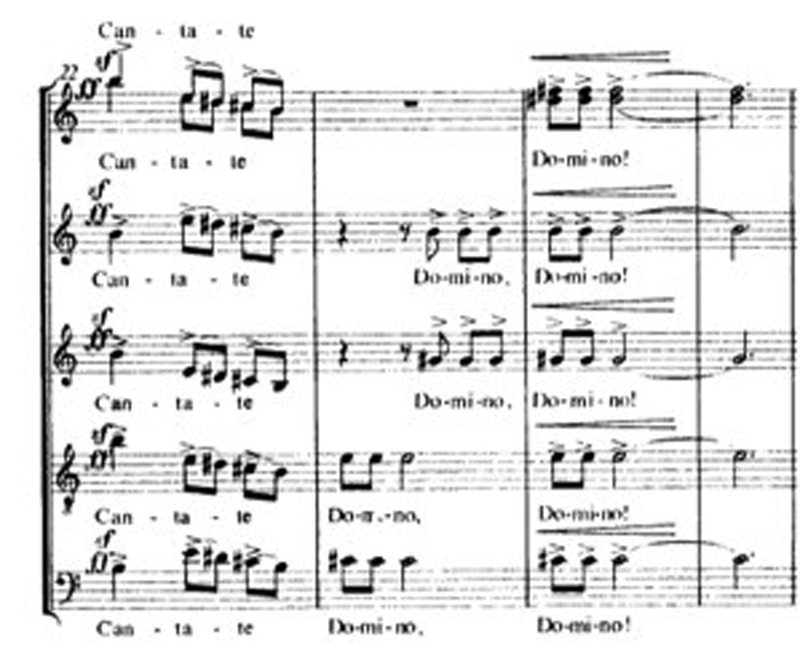 In Figure 3, note how the composer uses a variation of the chant line in the soprano/alto part to arrive at a significant cadence in m. 49. Karai’s Alleluia is a masterpiece of economy and excitement. 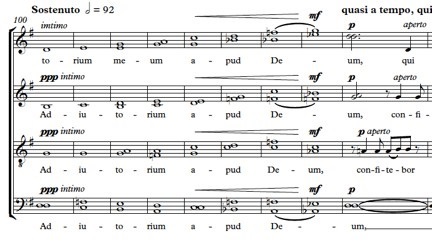 Other works to explore by the composer include the fast moving Hodie Christus, natus est for SSAA (Akkord Music, AKKOR00004) and De profundis for mixed choir (EMB 2452). Sándor Szokolay is a Hungarian composer born in 1931. 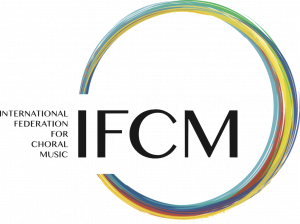 A student of Ferenc Szabo and Ferenc Farkas, Szokolay is an award-winning composer of instrumental, vocal, and choral music. One of his best known choral works is Duo motetti, op. 22 (EMB Z 8374). This work premiered in the 1962 International Choral Competition in Arezzo and features two movements drawn from biblical sources: i. Domine non secundum and ii. Cantate Domino. Szokolay’s music is very theatrical and filled with accented entrances, rhythmic drive and glorious dissonance. 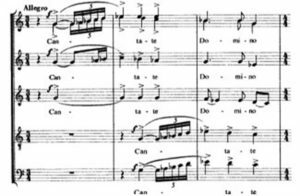 The composer’s skillful use of repetition keeps the musical material organized and cohesive; the opening flourish that captures the listener in the opening moments of the work appears soon after the beginning and both parts are sung again in a Da Capo. Szokolay uses high ranges notes and stretto entrances to build the first climax of the work. (Figure 5). From there, Szokolay continues to employ contrast as a chief part of the composition. Women are set against men and harmonic sections are set against rhythmic flourishes. 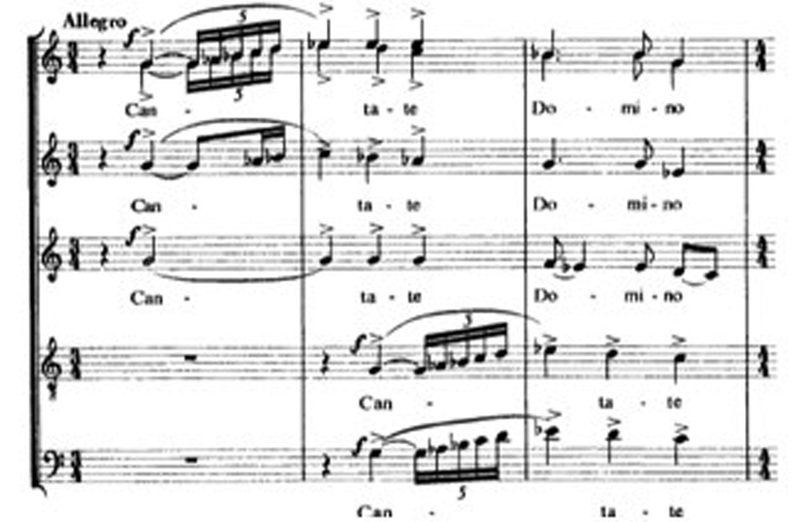 The rhythmic passages culminate in another dramatic climax that finds relief in a more homophonic section. After a repeat of the beginning section of music, the piece ends in a dramatic clash between D flat Major and C Major chords (Figure 6). György Orbán, born in 1947, teaches at the Liszt Academy of Music in Budapest. A popular composer, he is well known for his Daemon irrepit callidus. Orban’s Pange lingua is similar in style to Daemon and deserves to be better known. The Pange lingua text describes the last supper of Christ and touches on the mystery of transubstantiation. Orbán’s setting of the text is joyful and exuberant, even though the text is normally associated with Maundy Thursday and Holy Week. 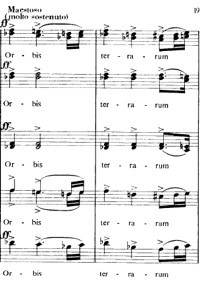 György Orbán’s Pange lingua is a rhythmically challenging work and well worth the effort. Hinshaw Publishing is making it available in the United States in January 2013. Other notable works include his Salve Regina (HMC1498) and Orpheus With His Lute (Lanthur Ha Szol) (HMC1766). Gyöngyösi is certainly a composer to watch as his works increase. 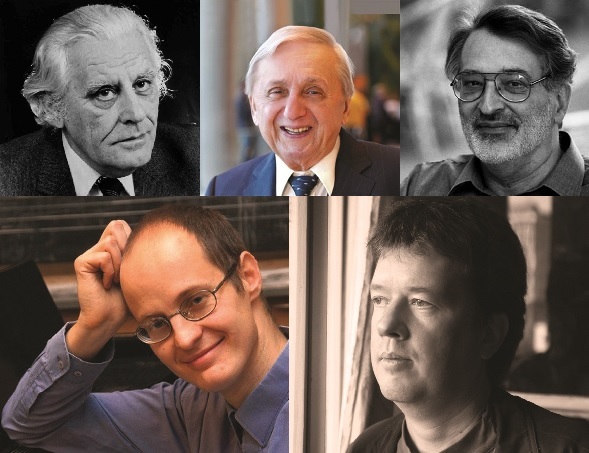 His Gloria Kajoniensis was recently awarded 1st Prize by the Jury of the European Award for Choral Composers. Other notable works include his Puer natus in Bethlehem, also dedicated to André van der Merwe and the Stellenbosch University Choir. 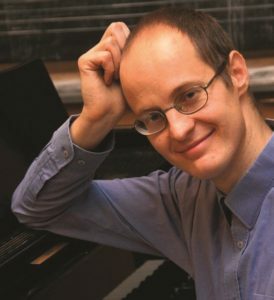 Like Gyöngyösi, Peter Tóth is one of the newest generation of composers from Hungary. Born in 1965, he currently serves as Associate Professor and department head of the music department at the University of Szeged. He founded Café Momusnzk in 1998, an online magazine dedicated to the classical music of Hungary. 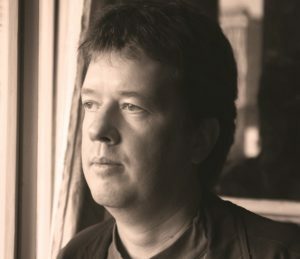 In 2009, he founded Kontrapunkt Music Publishing, a company with the stated goal of fostering the publishing and performing of Hungarian choral works. 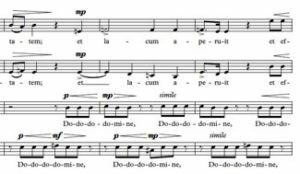 Tóth’s Magnus, maior, maximus for women’s choir (SSAA) is a brilliant piece of fast-moving choral music. 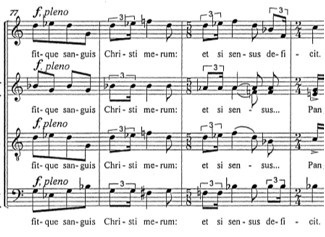 The work opens with a short two measure introductory portion and then introduces a rhythmic figure that becomes a fundamental part of the whole (see Figure 12). The contrast of rhythmic and melodic elements in the work is fascinating. First, the composer takes care to firmly establish the 7/8 rhythmic element in the first twenty-one measures of the piece with repetition and some exploration of the music in related keys. 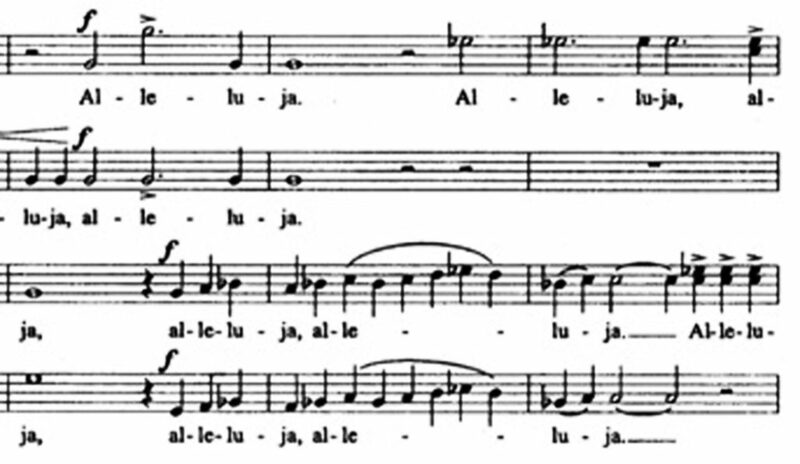 The lyrical melody makes it’s first appearance in m. 22 in the lowest voice. When the lyrical element first appears, it is in the meter of 4/4 but is set against the 7/8 pattern; the resulting rhythmic dissonance is reminiscent of a person holding two different thoughts in their mind at the same time, (see Figure 13). 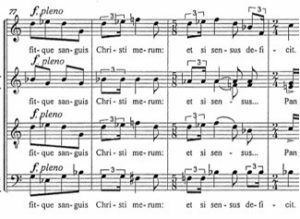 The juxtaposition occurs one more time in m. 57-64 and then the lyrical element makes a full statement of its idea (m. 69-74). There is a little ending action as the rhythmic idea makes a brief appearance and then the piece ends softly on a unison note.